With the Encore 50, Epos is gunning for the likes of ATC, Bowers and Wilkins and anyone else brave enough to poke their tweeter over the parapet. This speaker makes a statement of intent that no redblooded audio enthusiast could resist: it's made to play loud. Ironically, when you think of substantial speakers that play as loud as you like, Epos is not a name that comes readily to mind. It makes some pretty good speakers, but up until now they have been reasonably manageable, one man lift-type devices. But what the high-end Encore 50 promises, is Epos' signature timing and finesse combined with the ability to rock the house for the deep-pocketed. You can tell from this loudspeaker's stature that it means business, it measures 1,230mm high on its substantial and elaborate spikes and makes no concessions to the whims of interior design. This is a speaker for those of us who are not afraid to admit that bigger is better when it comes to recreating a musical performance in the home. It's 45-kilo carcass contains a set of drive units that have been designed to fulfil this mission. For the bass, Epos has used a pair of 220mm woofers that are not only sizeable, but have a lightweight cone made out of Kevlar, carbon fibre and pulp (or paper as it's usually known). A composition that's not dissimilar to the bass drivers in Bowers and Wilkins' 800 series models, these cones sit in an aluminium chassis with a big 40mm voice coil that has (+/-) 30mm of travel – a lot for a cone of this size – the driver doesn't have to work too hard to make itself heard. In a separate enclosure there is a 158mm midrange cone in the same material as the bass drivers and with a matching inverted dust cap, the idea being that the two systems can be seamlessly integrated through the crossover. This network is housed in a separate chamber at the bottom of the speaker, you can remove the back panel and see its air-cored inductors and, rather unusually, a tapped auto-transformer for adjusting midband output. Look underneath the speaker and you'll find a panel with a pair of cables in it that allows the midband output to be increased or decreased by one decibel and treble by 0.5dB. Interestingly, using the plus setting on the treble bypasses the resistor in the crossover. The tweeter is the only element on the Encore 50 that you will see on other Epos speakers, at least that's the way it looks, as this is actually a modified version of the Mi tweeter. Epos drilled out the pole piece and put a cap on the back of the driver that's damped and sealed. This, coupled with thinner ferrofluid, means that it can cope with the power delivery demands of the speaker as a whole. The cabinet is not quite what it appears to be either, its bass and midrange enclosures are built with a laminate of 20mm birch ply and the 12mm MDF that wears the real cherry veneer jacket. We don't recall anyone using this combination of materials before, but Epos reckons that the key qualities from the two materials makes for a cabinet that's both stiff and well damped. This is a well-built and substantial loudspeaker, but it's not a particularly beautiful one. It comes in one real -wood veneer finish and this, while entirely professional, is not quite as smart as we have encountered elsewhere. The Mordaunt-Short Performance 6 LE is marginally less expensive, but looks rather more so in its striking moulded enclosure. The Monitor Audio PL200 and Tannoy Definition DC10T are better finished. The Epos is well-built though and a lot of thought has gone into the massive spikes which are nicely machined and can be easily adjusted from above. The drive units may not look particularly high tech, but they are well-engineered with alloy baskets and excellent fit and finish. One unique feature is the 'skateboard' that Epos supplies for you to move the speaker about on. With a speaker of this weight this is a major boon for every mere mortal that wants to install it. This is undoubtedly a high-value loudspeaker from Epos. From its tri-wire/-amp cable terminals to its footprint-extending plinth and dual-material bass enclosure, the Encore 50 does not skimp on either the details nor the overall build. It weighs a lot more than all of its competitors at the price and while mass is no indicator of sound quality it often reflects on the build. The lamination is probably where this extra bulk comes from and it should make for a more solid bass enclosure. 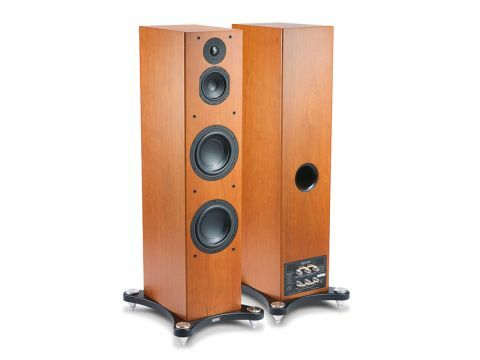 The physical mass of the Encore 50 clearly helps when it comes to bass, which is both well-extended and controlled. It's also very even, in fact the whole speaker is very even, but this doesn't always make for maximum entertainment. It's very neutral balance is a shade on the restrained side which can undermine the ability of the music to really provide a thrill. This can also be compensated for with the right electronics, so we tried a number of alternatives. We dropped in a Leema Antila II CD player in place of our Copland CDA 825, the latter being the more refined and revealing player but, in balance terms, it's too calm for the Epos. With the Antila feeding a Classé CP-700 preamp and Gamut D200 III power amp more of the Encore 50's qualities become apparent. Chief among them is a fabulous sense of ease, this is a speaker that does not have to try too hard (thanks to the way that designer Dave Berriman has engineered it) to be able to play at high levels. It also sounds more efficient than the sensitivity rating would suggest, which is a very appealing thing and contributes to the effortlessness of the presentation. We also had Quad's new integrated amp on hand for a short period. It only produces 25 watts, but every watt counts! This amp proved the best partner of all, by adding richness of tone and a seductive curviness to the result. It doesn't allow the Epos to reveal the full extent of its room shaking powers, but the transparency of the mid is loud and clear. Voices are particularly well served and we got a remarkably revealing result with artists as diverse as Gillian Welch and Donald Fagen. In many ways, this speaker only really comes into its own at high levels, a quality that's rare even at this elevated price point. If your tastes include music from the heavier end of the spectrum and you have some suitably lively electronics it's a lot of speaker for the money. If you are constrained to playing at normal levels, however, its presentation does mean that the music can lack energy and zip. This is probably due to timing more than balance, speed is not a strong point by the standards available elsewhere. Bass on the other hand, is powerful and well extended and this combined with the ease that it exudes whatever you play will make it appeal to many.